The biggest finance event for the OFW in the United Arab Emirates will happen this March 20, 2015! Be part of the learning by attending this life-changing event and learn from the experts who have a heart to help bring financial education to the OFWs! My guests for this conference are all advocates for financial literacy and have extensive training & experience in finance and investing. 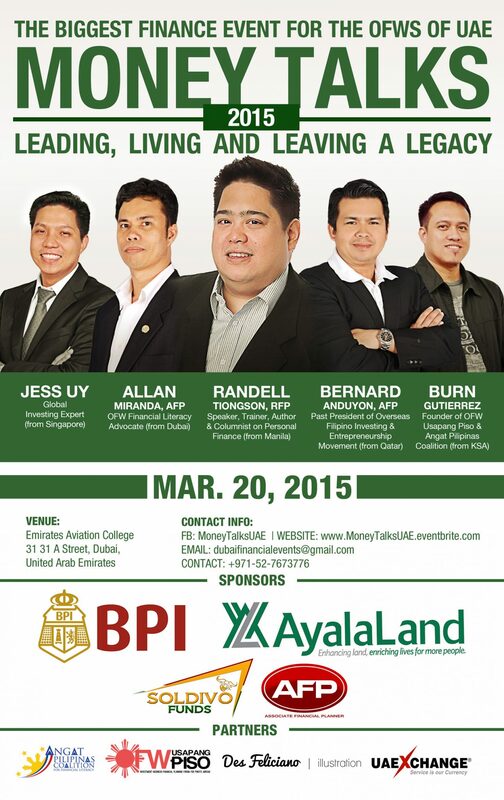 Allan Miranda – Allan is the most recognizable OFW in UAE when it comes to financial literacy. He has been conducting successful seminars in Dubai and Abu Dhabi for a few years now and he is seen as the champion of the OFWs when it comes to financial enablement. He is based in Dubai, UAE. Burn Gutierrez – Burn is the founder and main driving force behind the hugely successful OFW Usapang Piso forum and the Angat Pilipinas Coalition. Due to his efforts, thousands of OFWs are becoming financially abled through his extensive work using the internet and now even live events in many parts of the world. Burn’s team is composed of many volunteers and leaders and virtually every city in the world where there are many OFW’s. He is based in Al Khobar, Saudi Arabia. Bernard Anduyon – Bernard Anduyon was the immediate past President of the Overseas Filipino Investing & Entrepreneurship Movement, a group that is almost single handedly transforming the financial lives of the OFWs in Qatar. Doha has a high concentration of financially abled OFWs because of the efforts of Bernard and his movement. His group has been deputized by the Philippine embassy in Qatar to provide financial education to the OFWs in that region. He is based in Doha, Qatar. Jess Uy – Jess is known as the international investing expert and has been active in investment education and financial planning amongst many OFWs. He has successfully conducted seminars in many countries like Japan, Brunei, Dubai, Qatar, Hong Kong and Singapore. Jess is based in Singapore. I want to thank you for your great talk this afternoon. you and your team done a great job. Hope that I can participate in your future speaking events. More Power and God Bless.